MISSION, KS--(Marketwired - Sep 20, 2016) - (Family Features) For millions of school-age children, each day begins and ends with a bus ride. 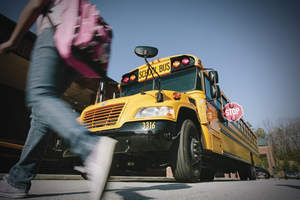 While parents entrust their children's safety to the capable hands of bus drivers, these tips from the National Association for Pupil Transportation provide some measures parents can take and lessons they can teach to increase safety going to and from the bus, and even during the ride. Ensure backpacks are packed securely so papers and other items don't scatter as the bus approaches. Remind kids that just like when riding in your car, loud noises are off limits so they don't distract the driver. Make the bus ride part of your daily "how was school?" discussion. Encourage kids to talk about the things they see and hear on the bus, so you can discuss appropriate behaviors and, if necessary, report any concerns to school administrators. "As a former teacher, I know that parents often overlook how the ride to and from school can impact a child's performance in the classroom," Hager said. "A child's attitude or behavior before they arrive at school can set the tone for the whole day." Another safety consideration is the health impact of older diesel buses. The shorter height of younger students can put them face-to-face with a black cloud of diesel smoke every school day. With propane buses, however, students aren't exposed to the harmful particulate matter in diesel exhaust, which is known to aggravate asthma and has been identified by the World Health Organization as a carcinogen. Not only is propane consistently less expensive than diesel, the buses themselves don't require the same expensive repairs and replacement parts that today's modern diesel buses demand. Saving money on transportation costs puts schools in a better position to meet students' needs in the classroom and other areas, such as fine arts and athletic programs. Established in 1974, Family Features is a leading provider of free food and lifestyle content for print and online publications. Our articles, photos, videos and web content solutions save you time, money and help create advertising opportunities. Registration is fast and free - with absolutely no obligation. Visit editors.familyfeatures.com for more information.